Salt as a mineral is as equally enigmatic and shot through with paradox: it is the only rock that human’s eat, it can both preserve and erode, we associate it with dryness but it can be isolated from water, it is rock and dissolves but can be returned again to its solid state. Its final paradox is in its’ both essential quality to life and flavour in food but ultimate invisibility, reduced to the familiar and overlooked daily table condiment, and never really discussed as an ‘ingredient’ with any provenance in the way say flour in artisan baking has come to be discussed. This reduces salt to a sense of singularity when in fact it is as varied as the multiple ancient grains now sourced for flour, salt being sourced from both rock and sea. In many ways salt has suffered a similar fate to sugar in general consciousness inhabiting a more statistical discourse then other consumables and one that concentrates on how much of it is good for human health reflecting government health statistics or RDA (recommended dietary allowance). No added salt, like no added sugar has become a consumer watchword, and reflects the changing agendas that have become attached to foodstuffs. However the ‘taste’ for salt is much more that a government statistic, the fight for it mirrors our changing cultural, philosophical and technological relationship to the world. More directly in relation to legacy ‘salt towns’ in Britain can continue to be identified today by the presence of the Anglo Saxon wich in their name. Droitwich, Sandwich, Nantwich, all bear the legacy of being ‘a place where there was salt’, leaving a very physical ‘salty’ imprint on the urban scape. More than flavouring salt has a complex relationship with our eating habits. A taste for salt, unlike sweetness, is also shared with animals; cattle for example will lick a wall to extract its salty deposits. A naturally occurring salt lick would attract animals over distances in search of its bone and muscle enhancing nutrients. This ‘salt tie’ has been suggested as one means by which man tamed animals for domestic use and looked to rear them for meat. Man had only to provide and then return with salt for cattle roaming in pasture to keep them ‘tied’. Salt therefore helped in facilitating the maintenance of a varied meat diet. Ironically as our diet moved from being totally carnivorous and showed increased consumption of vegetables salt became even more prized, Margaret Visser even suggests that it is at this point that we start to get addicted to salt. The development of cultivating crops and then the ability to boil vegetables directly over a fire, enabled by the development of metal cooking pots, made vegetables more plentiful in the diet but this naturally meant less salt which was readily present in the salty blood and bones of meat but boiled away in the cooking of vegetables. A taste for salt therefore became even more intensified as we looked to add it to food where it was not naturally occurring or diminished by cooking. In Scotland, salt production is only known to have begun in the Middle Ages, much later than elsewhere. Without enough heat from the sun in the colder British northern climate to naturally evaporate the seawater to extract the salt, wood or coal were burnt instead. Most salt production was concentrated on the River Forth with the Prestonpans works being the most prominent example and also the last remaining of its era, finally shutting down in 1959. Today, after half a century of almost no salt production in Scotland, in 2011 two companies emerged producing the product, in both cases from the sea: ‘The Hebridean Sea Salt Company’ on the Isle of Lewis and the Isle of Skye ‘Sea Salt Company’. Both lay claims to their salt having greater taste and trace mineral elements that are good for human health, such as potassium, calcium, magnesium and zinc, the health benefits originally attracting cattle, unlike standard table salt. In order to understand whether the human body actually processes these sea salts in a healthier way than more processed varieties would require much further and more longitudinal scientific research but the fact that the discussion around ingredients and health in salt is happening at all reflects perhaps a changing consideration and status for it in line with other more ‘favoured’ ingredients. The inclusion of salt as the key part of a recipe, like the history of salt itself, has its own narrative and paradoxes but beyond all else, as Shelia Dillon recently put it on radio 4’s ‘The Food Programme’ salt in this context enables a joining of all the dots on the culinary map. This programme dealt exclusively with ‘Salt Fish’ that as a dish links Britain, Europe and the Caribbean. Contemporarily salted cod or ackee is most familiarly encountered as Caribbean festival food but its history began in the cod trade around Britain in the 15th and 16th centuries. 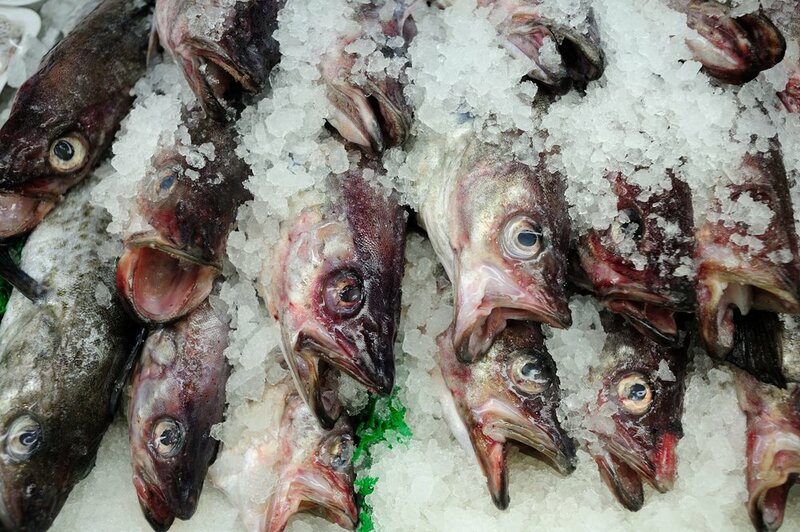 At this time the western seas were thick with cod, so much so as to warrant a comment in Shakespeare’s The Tempest, and much cod was salted and dried at this time. However a culinary taste for salted fish eluded the British. Instead it was traded for Spanish and Portuguese wine facilitating the history of salted fish as key element of celebratory cuisine in those countries rather than in Britain. One exception was Liverpool, which as a port had its own influx of salted fish where it became popular as a particular cure for hangovers! Ackee is Jamaica’s national dish. It can be eaten any time or any day of the week. However, it is traditionally served as a breakfast meal on Saturday and/or Sunday, or on special occasions. Ackee and saltfish is sautéed saltfish (codfish) with boiled ackee, onions, thyme, Scotch Bonnet peppers (optional), tomatoes, red bell pepper (optional), garlic, black pepper and pimiento. Ackee is Jamaica’s national fruit. A heated debate amongst Jamaicans is whether Ackee is a vegetable or fruit. Op cit ‘The Food Programme’ Caliban in The Tempest is referred to as smelling like ‘poor John’, which was the name for salt cod. ELISA OLIVER - Elisa has a background in art history and within this a longstanding interest in the experiential and interdisciplinary in cultural practices, which includes food and its related activities. She teaches at MMU and Leeds Beckett University and she is Co Director of the online journal Feast www.feastjournal.co.uk. She recently completed work on a curated meal for the James Joyce Centre Dublin, ‘Tasting Joyce’ and is currently looking to develop the idea of ‘tasting’ as a curatorial and interpretative model. She will be developing a new website in 2018 but for now some details of her work can be found at www.feastjournal.co.uk, and instagram @feastmagazine and @eoelisa. AMANDA FORMISANO - Amanda blends can academic background rooted in history and anthropology with a love for simple ingredients cultivated in Italy. She lived in Italy and Austria where she honed and obsession in food and drink obsession until 2015 when she moved back to Edinburgh. She has worked in the industry since in a variety of roles, with her main focus being on the quality, simplicity and integrity of ingredients (a reflection of the Italian approach to food and drink). She can be found on twitter and instagram, whilst she doesn’t post much she’s hoping you might help her use them both more.